St. Malachi's prophecies have come into focus lately, especially since Joseph Ratzinger, became Pope Benedict XVI. He is NOT to be confused with the Old Testament prophet who wrote the Book of Malachi. Saint Malachi was an Irish Catholic Bishop who lived in the 12th century. During a trip to Rome, he had a vision about the future Popes. He wrote a brief description of each Pope, and his comments have turned out to be impressively accurate. For instance, he said of Pope Benedict XV's papacy [1914-22] "religio depopulata", meaning "religion depopulated", or "religion laid waste". During his 8-year papacy, World War I killed 20 million in Europe, Catholics for the most part. In 1918 the pandemic known as Spanish flu killed 50-100 million worldwide, and the Russian Revolution in 1917 forced its vast population to live under forced atheism. Malachi called Pope #265 John Paul I  "de medietate lunae", "from the half moon". He became Pope on August 26, 1978 when the moon was exactly half-full. He was born in Belluno, meaning "the beautiful moon", a province in Northern Italy. His name was Albino Luciani, meaning "white light", which is how the moon appears in the sky. His successor, Pope John Paul II [1978-2005] he called "de labore solis" "of the eclipse of the sun". John Paul II was both BORN during a partial solar eclipse, and his funeral took place on April 8, 2005 during another solar eclipse. His prophecy indicates there will be ONLY ONE MORE POPE, then Rome will be destroyed. According to Malachi, there would be 268 Popes. The present Pope, Benedict XVI is #267. The next, AND FINAL Pope, according to Malachi, will be "Petrus Romanus" [Peter the Roman]. What makes the prophecy even more compelling is that this Peter "will reign during the FINAL PERSECUTION of the Roman church". He will also "feed the sheep in many tribulations. When they are finished, the city of the 7 hills [Rome] will be destroyed, and the formidable Judge will judge His people". This sounds strikingly similar to the Book of Revelation's chapters 17 and 18. His timing also seems to correspond unbelievably well with other Scriptures, particularly Luke 21:25-36. Was Malachi a true prophet? I believe he was. Thus far, none of his 266 descriptions has EVER been wrong [Deuteronomy 18:21,22; Numbers 12:6]. His predictions DO NOT, in any way, shape or form contradict the Bible [Deuteronomy 13:1-3]. They seem, rather, to line up perfectly with Scripture. I know some Christians feel that anything or anyone "Catholic" is to be AUTOMATICALLY SHUNNED. I'm NOT one of those Christians. While some Catholic doctrines are not supported by the Bible, and while there has been HORRIBLE ABUSE OF POWER in Catholic history, THERE HAVE ALSO BEEN TRUE BELIEVERS IN JESUS CHRIST, many of whom have tried to reform the Church during its turbulent history. Martin Luther himself, the leader of the Reformation, was at one point a Roman Catholic theologian. DO NOT, my dear Evangelical brothers, "throw the baby out with the bath water". If God can raise Abraham children FROM STONES [Matthew 3:9], He can also bring forth true prophets from Roman Catholicism. He is no respecter or persons. Nor is He respecter of denominations. Do we base eschatological doctrine on what St. Malachi prophesied? No. We BASE IT ENTIRELY ON THE BIBLE. However, since Malachi's predictions DO NOT contradict the Bible, but rather are VERY MUCH in line with it, they should at least be taken into consideration, within the context of BIBLICAL ESCHATOLOGY [1 Corinthians 14:3,4]. Malachi's most interesting description, concerns THE PRESENT POPE. What did he have to say about Benedict XVI? In his heretofore astonishingly accurate prophecy, St. Malachi described the present Pope, Benedict XVI, as "de gloria olivae", meaning "the glory of the olive". According to St. Malachi's prophecy, there will be one more, FINAL Pope or leader of Roman Catholicism, after Benedict, whom he named "Peter the Roman", who will lead Catholics under great tribulation, at the end of which Rome will be destroyed. His prophecy fits PERFECTLY with the scenario depicted in the Book of Revelation, chapters 17 & 18. So, what could "glory of the olive" mean? Some had speculated that the Pope would be from the Benedictine order, since they have a sub-order which calls itself "Olivetans". However, Joseph Ratzinger (his original name), while he did adopt the name Benedict, IS NOT FROM that order. Others have suggested that the "olive" stands for peace, or for Catholic reconciliation with the Eastern Orthodox churches, or for better relations with Israel. But NONE of it FITS. Roman Catholics are no closer to reconciling with the Eastern Orthodox, nor have relations with Israel significantly improved. Indeed, there was a storm of controversy when Pope Benedict visited Israel in 2009, because he, being German by birth, DID NOT apologize for the horrors of the Holocaust, or for the Church's silent and passive role during this atrocity. There was also uproar when he visited a Palestinian refugee camp and openly called for the formation of a Palestinian state, all the while IGNORING the plight of thousands of Palestinian Christians, living under Islamic oppression, and constant threats by Hamas, in Bethlehem and surrounding areas. So, what could this term "glory of the olive" mean? In the Bible the OIL of the olive is always associated with THE ANOINTING of God, or His Anointed One, the Messiah (Psalm 23:5; Isaiah 61:1; Luke 4:18). iF THE Anointed One (symbolized by the "Olive") is GLORIFIED, this would point to Jesus being glorified in His Church. Interestingly, Jesus delivered His teaching about the end times while sitting with His disciples on the Mount of Olives (Matthew 24:4; Mark 13:3,4). The Mount of Olives is also where He will descend, with His raptured saints, at His Second Coming (Zechariah 14:4). Considering that Malachi's prognostications have been right on target, and taken in the context of biblical prophecy, in Romans 11:16-24, the olive represents spiritual Israel, God's chosen covenant people. Spiritual Israel comprises ALL true believers in Israel's Messiah, Jesus Christ, who have acquired a NEW, born-again nature, whether they be natural Jews or Gentiles (Romans 2:28,29; Ephesians 2:11-15). Another name for SPIRITUAL Israel is "the Church". In that context, "the glory of the olive" would mean that, during Benedict's papacy, the Church will be glorified. The glorification of the Church (of the olive, spiritual Israel, the Body of the Anointed One), would mean THE RAPTURE (1 Corinthians 15:50-55). The pontiff is presently 89 years old (turns 90 on April 16, 2017), and in declining health. Malachi's been 100% right, so far. 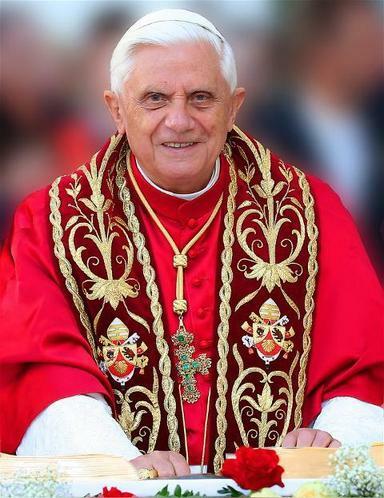 Did Malachi prophesy that the Rapture will happen during the papacy of Benedict XVI? Since this article was originally written (in 2011) Benedict has resigned as Pope and assumed the title of "Pope emeritus." Considering that he is still around, and still holds the title of "Pope", albeit emeritus, and considering the prophecies God delivered thru Jeremiah, Daniel, and Luke which indicate the catching up of believers SHOULD HAPPEN this year, I'm convinced that he did. Not only does Saint Malachi have an impressive record of ACCURATELY depicting each Pope, his prophecy seems to be IN PERFECT SYNC WITH the Book of Revelation. Personally, I believe him to be a true prophet who DID receive divine revelation. If you disagree, that's fine. For obvious reasons, the most intriguing and exciting are THE LAST TWO descriptions. The present Pope emeritus, Benedict XVI, is called the "glory of the olive", a title that is rife with prophetic significance, as noted above. "In the EXTREME PERSECUTION of the Holy Roman Church, there will sit (i.e., as bishop) Peter the Roman, who will feed his sheep IN MANY TRIBULATIONS: and when these things are finished, THE CITY OF SEVEN HILLS (Rome) WILL BE DESTROYED, and the formidable judge will judge his people, The End." Sounds A LOT like Revelation chapters 17 and 18. So, Pope Benedict, according to Malachi, will either die, be killed or be raptured (let's hope it's the latter) and will be succeeded by this Peter. The designation "Peter the Roman" has stirred A LOT of controversy. 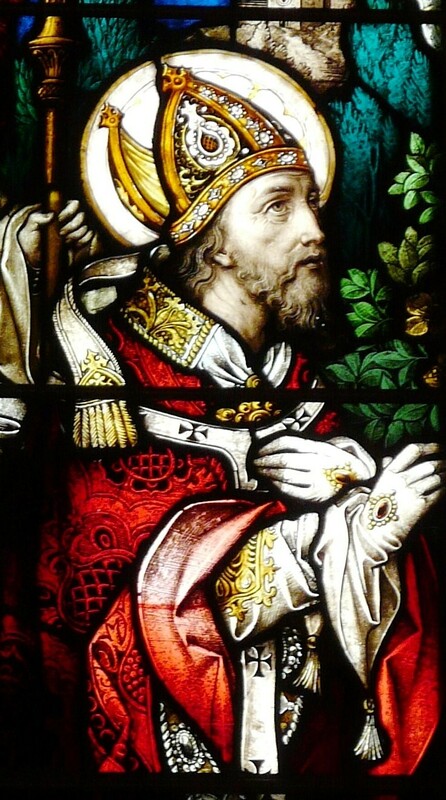 The apostle Peter is considered by Roman Catholics to be THE FIRST Pope. There's never been Peter II. No Pope in the Church's long and convoluted history has EVER taken the name Peter. There have been Leos, Juliuses, Innocents, Urbans, Clements, Piouses, Gregorys, Alexanders (just to name a few), Johns, Pauls and even John Pauls, BUT NO PETERS. However, that's A TOTAL MISCONCEPTION. NOWHERE does Malachi say that this man WILL CHOOSE Peter as his pontifical name. In fact, Malachi doesn't give THE ACTUAL ADOPTED NAMES of ANY of the 267 Popes; he merely provides some DESCRIPTIVE moniker. So WHY WOULD IT BE ANY DIFFERENT with the Catholic Church's last leader? The designation "Peter the Roman" should be understood to be DESCRIPTIVE just like "of the half moon" was descriptive of John Paul I, or "shepherd and sailor" of Pope John XXIII. Malachi does NOT even say that this Peter will be ELECTED Pope. He could, therefore, be someone who becomes de facto leader of the Roman Catholic Church after the present Pope's demise or disappearance (or resignation). Indeed, if the tribulation is underway and remaining Catholics are being persecuted, it's hard to envision cardinals having their customary conclave to elect a new Pope. Be that as it may, and since we're living at the time of the end, who might this "Peter THE ROMAN" be? If Malachi is correct, Petrus Romanus MUST BE AROUND SOMEWHERE. Two possible candidates have been offered for the role of "Peter the Roman". They are Monsignor Pietro Parolin an official with the Vatican's Roman Curia and Holy See's nuncio (representative) to Venezuela (since this article was originally written Parolin has been promoted to Secretary of State under Pope Francis), and Tarcisio Pietro Bertone, a cardinal and diplomat who currently serves as cardinal Secretary of State for the Vatican and one of the few individuals privy to the Third Secret of Fatima (see respective pictures below). (Since this article was originally written, in 2011, Bertone has retired). So, we have two Pietros or "Peters" who could, potentially, fulfill Malachi's final pronouncement. That still leaves the description "the Roman" which must have some pertinent application to THE RIGHT candidate. 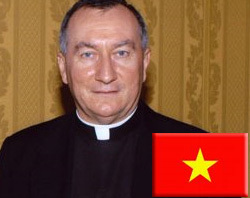 It's hard to imagine anyone thinking of Parolin as "the Roman" other than the fact he's a member of the Roman Curia, but so are hundreds of others. He's not from Rome, but was born in the town of Schiavon, in the region of Vicenza in northeastern Italy. 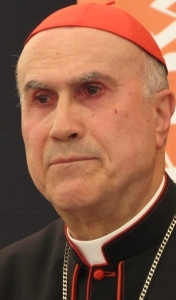 Tarcisio Pietro Bertone, on the other hand, comes from the town of Romano Canavese, in the province of Turin (where the Shroud of Turin is kept), in the Piedmont region of northwestern Italy. So, the designation "Peter the Roman", seems particularly apropos to him. In the death or absence of the present Pope, Bertone would doubtlessly be on the short list for possible "new Pope". (He was, but Francis was the one elected by the conclave). And if the College of Cardinals, because of tribulation, persecution, or some other reason, is not able to carry out its duties and elect a successor, it would make perfect sense for the FORMER Secretary of State to take over the leadership in an unofficial capacity. Of the two candidates, my money (to use a worldly term) is on Bertone. Are you Catholic? Have you ASKED JESUS TO ENTER YOUR HEART? If you HAVEN'T, I urge you to do so immediately. If you need help in doing so, click on the link below, or write us. I'm NOT asking you to switch religion, I'm asking you to INVITE Jesus - the Jesus you already love and believe in - to enter your heart. Those IN WHOSE HEARTS Jesus LIVES will soon be caught up to heaven. Those who ONLY have religion WILL SUFFER TRIBULATION. It seems that the religion that claims to have BEGUN with Peter will also END with a Peter. It seems that Malachi's prophecy will hold up TO THE VERY END.